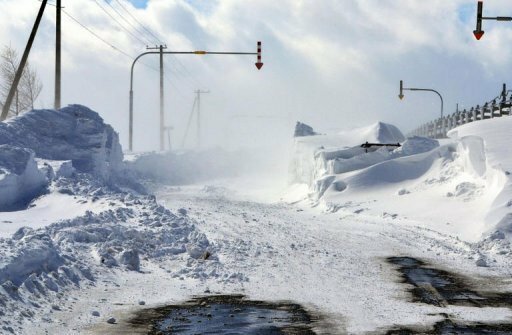 A road in Nakashibetsu town on Hokkaido island is seen covered in snow on March 3, 2013 after severe weekend blizzards sweep northern Japan. At least nine people died in snow-related incidents in Hokkaido over the weekend, including a father who froze to death while sheltering his nine-year-old daughter, reports said Monday. A father froze to death while sheltering his nine-year-old daughter from severe weekend blizzards that swept northern Japan, two years after her mother died, reports said Monday. Mikio Okada died as he tried to protect his only child Natsune against winds of up to 109 kilometres (68 miles) per hour, as temperatures plunged to minus 6 Celsius (21 Fahrenheit). The pair had last been heard from at 4 pm on Saturday, after fisherman Okada picked his daughter up from a school where she was being looked after while he was at work. The two were found just 300 metres from the truck at 7 am on Sunday.